The Europeans like naming their exploring ships after the last letter of the alphabet. This is great for the Archive, as we had a difficult time finding tattoo references starting with the letter Z for our Tattoo History A-Z. The French explorer Jules Sebastien Cesar Dumont D'Urville (1790-1842) sailed from France on two corvettes the Zelee and the Astrolabe. 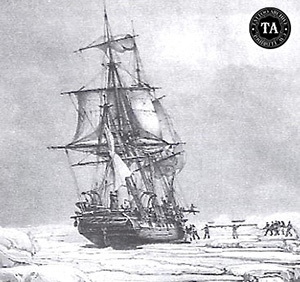 He was to explore the area south of Tierra del Fuego, the southern tip of South America, and search for the South Pole. 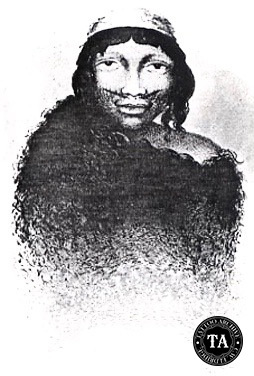 D'Urville befriended the Patagonian Indians of South America whose body decoration included painting across the cheeks and lips. D'Urville went on to discover what he called Adelie Land, which was named after his wife. Today we know that part of the world as Antarctica.